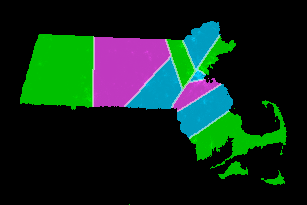 The Shortest Split line method of districting, while not perfect is one of the best methods of redistricting for any state large or small. Using a mathematical algorithm to divide the state in to the required population sizes, we can almost guarantee an unbiased representation of public interests. By dividing the state up in this way, as opposed to by town or by other other municipal borders, we eliminate discrimination from race, wealth or gender. Because these lines do not consider those living with them, they make sure that every vote is equal to every other one. Most important of all, the shortest split line method removes the possibility of politically biased redistricting. When everyone is apportioned fairly, all interests are represented fairly. Let N=A+B where A and B are as nearly equal whole numbers as possible. Asterisk: If anybody's residence is split in two by one of the splitlines (which would happen, albeit very very rarely) then they are automatically declared to lie in the most-western (or if line is EW, then northern) of the two districts. This formula has been taken from www.rangevoting.org visit it for more information and see their ballot initiative in your state! Whether or not we can remove the scourge of gerrymandering from our legislative districts we must begin to distribute our electoral vote proportionately to the votes cast in a presidential election. The good people of Massachusetts dutifully report to the poles every four years to elect our president. However, under our current system many of the voices are silenced. Because we are a winner-take-all state many of our voters are silenced despite the effort they put in to selecting a candidate. This is unfair, both to the candidates and to you, the voter. Simply by granting our electoral votes in line with the want and need of the people we can more clearly and accurately represent the will of the people. After all, that's what elections are for. It is true that some people are bad, but they are few and far between. For the most part, the kinds of people who suffer from the crippling addictions caused by heroin, opioids more generally, and many other drugs, are just like you and me. They aren't evil, and they aren't harmful, they are slaves to their addiction. Through the efforts of our Governor and many local officials we are beginning to turn the tide on this crisis, but there is still so much more to do. We must make it clear that when you suffer in this way, you are not a criminal, you are not a monster, you are still a human being, and we are here to help. Through the establishment and expansion of existing rehabilitation programs, and by focusing on the needs of these individuals we can better identify people who are most likely to succumb to addiction, better educate the community on the signs which might indicate you or a loved one might be suffering, and how to reach out to these people. We cannot have them live in fear, we cannot let them suffer in silence. We must act in their interest and in our own.